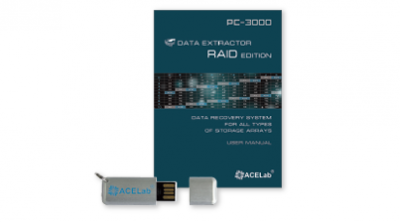 The Data Extractor UDMA RAID Edition is a specialized software product intended for recovering data from RAID storage devices. Functioning in tandem with the PC-3000 UDMA hardware-software product, it forms the PC-3000 UDMA RAID Professional System. Today, RAID arrays have a large number of drives and have complicated structures (combined and proprietary levels) while several members of a RAID can have serious physical damage (damaged surfaces, HSA, servo-information etc.). The file system metadata of the RAID can be also damaged. These problems may also occur simultaneously. The Data Extractor UDMA RAID Edition is a professional instrument that has a wide range of functions for solving all major problems completely. The Data Extractor UDMA RAID Edition can work with two damaged HDDs connected to PC-3000 UDMA ports within one task at the same time. The total number of the connected HDDs can be increased by using motherboard ports and file-images. Ability to skip the damaged HDD while defining the array configuration or to use data taken from copy. Redundancy usage with the purpose of data recovery from the problematic HDDs. Integrated logical analysis features that allow for reading only the minimally necessary amount of data from the storage device, thus reducing the load and increasing the chances of successful recovery. Before the Data Extractor UDMA RAID Edition appeared, you would have had to have made a full sector-by-sector copy of the data from the simple stripe if one of its members was physically damaged and could not be connected in a standard way, or it would not have been possible to get access to its sectors without using the PC-3000 UDMA or PC-3000 SAS methods. You could only have attempted to recover the user data after creating a copy. Open the Virtual RAID in the Data Extractor Explorer and get an understanding of the data organization in the virtual RAID. Build a map of the required data. It can be a map of used sectors, a data map of the required catalogs, a necessary file map, or a metadata map. For the built map, build a "Sub-map" of sectors to be read from the damaged HDD. Make a sector-by-sector copy only of these required sectors by using the Data Extractor. RAID configurations can be very complex and data recovery from RAID is not easy even if the configuration appears to be simple. It can be difficult to define the correct order of HDDs, the block size and the initial shift. Even if you know the full configuration of a RAID and there are no problems with the damaged HDDs, recovering data from a RAID can be a complicated task for multiple reasons: a large number of drives which need to be connected simultaneously, slow read speeds, impossibility to assemble an unusual array configuration, or logical damage.